Has senseless slaughter lost its charm? Tired of earning cash the old-fashioned way? Here's how to cash in on the Los Santos stock market and get rich in GTA 5! Like a billion dollars rich! How to make money in GTA 5 by playing the stock market. Pfft. Money. Who needs it? Cold, harsh cash can't buy you happiness. It can only purchase the cheap, meaningless joy that comes from a diamond-studded, jet-setting lifestyle. Austerity and moderation? Now, that's where it's at. Who really needs all the money they'd ever dream of in GTA 5? You certainly wouldn't be interested in a guide to making money in GTA 5, would you? For more on GTA Online, head on over to our GTA 5 and GTA Online Guides Hub. Over there you’ll find info on GTA Online Heists and GTA Online Gunrunning. Okay, who am I kidding? We both know why you're here. To buy every golf course and woman of negotiable virtue in Los Santos, of course. Excess is Grand Theft Auto's middle name and we're here to make sure you can wring out every last, blood-stained penny from everyone's favorite new sandbox. 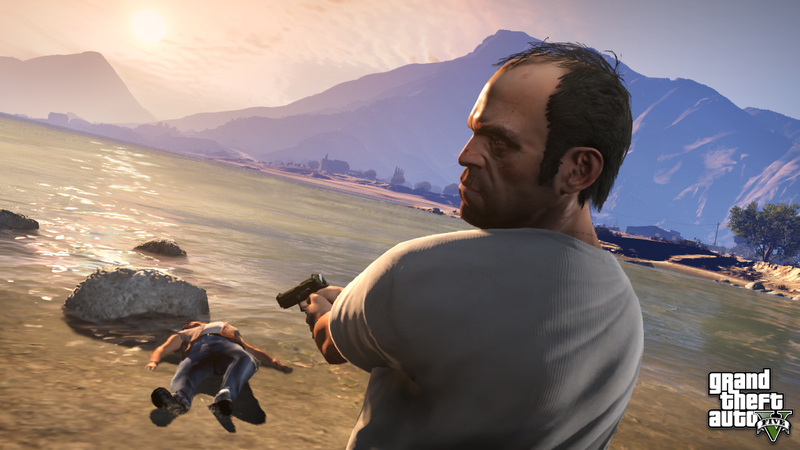 Yesterday, Jaz started the ball rolling with a rundown on the many cheat codes in GTA 5. Today, we're going to talk about the bulls and the bears. This is our guide on how to make money in GTA 5. Here we'll detail the best ways to make money in GTA 5 on PS4, Xbox One, PC, Xbox 360, and PS3. There are two stock markets in Grand Theft Auto 5: the LCN, which is affected by in-game events, and the BAWSAQ, which is influenced by the game's smorsgaboard of dirty-dealing players. While it's somewhat harder to alter the flow of the latter, the former is largely fair game. How so? Because much like in real name, the stock market fluctuates based on current events. If bad things happen, prices drop. Now, can you guess where I'm going next? Right. You're the bad thing. So make bad things happen. Simply follow our GTA 5 Stock Market Guide and you'll be making loads of money in GTA 5. Invest in the automobile industry. Which company makes your favorite car? Lampadati? Coil? Vulcar? Once you've determined a pet manufacturer, go out there and shoot every single one of their products down. Literally. Torch them. Perforate them. Paint them with Justin Bieber decals. I don't care what. Just destroy as many of them as you can. This, in turn, will cause the company's stocks to plummet. Once you're done with that? Purchase all the inexpensive stock you can before going out and doing what you just did again. This time, target everyone else. With a little bit of effort, you'll be able to raise your own company's stocks by virtue of making certain no one else has an assembly line. At least, that's what certain armchair statisticians think. Similarly, you can purportedly affect other businesses as well by causing mass chaos at their rivals' outlets. Whether it works or not, well, that's still being debated but if you needed an excuse to beat up unsuspecting fast food workers? Well, there it is right there. Petty crime doesn't pay. Big, corporate-level crime does. Uncle Lester loves his 'kids'. Begin the story. Keep going through all of the missions, don't worry when you do the LifeInvader assassination as you can't affect stocks at that point. The last two steps aren't very important and and to be honest this assassination will hardly change the outcome at all as you have very little to invest, but you may as well if you want the extra cash. Finish off the main storyline. If you did the last heist right, you should have around $40M to spend on each character. Now it is time to make some real money. In this assassination you are damaging the shares of Redwood in order to raise the shares of Debonaire. The Debonaire stocks will peak at around 80% return, with Redwoods peaking at around 300%. You may have to wait a few days for Redwood to rebound, so just keep sleeping until it peaks. In this assassination you are damaging the shares of Facade in order to raise the shares of Fruit. The guides that I have seen have often missed a crucial step in this assassination: invest in Facade as it rebounds. The Fruit shares will peak at around 50%, with Facades peaking at around 30%. This step is the difference between making around $1.5B and $2.1B, so make sure you don't forget it. Once again Facade may take some time to rebound so just keep sleeping until it hits the peak. This assassination is slightly different as it focuses entirely on the Vapid stock rebounding after you damage it. The Vapid stock rebound will peak at exactly 100%. You'll have to wait a few days for the stock to rebound, so keep advancing time and checking the stocks at any time after 8am. This assassination has no rebound and focuses on getting GoldCoasts business back from another construction firm (not on any of the stock exchanges). The GoldCoast stocks will peak at around 80%. More? More Ways to Make Money in GTA 5. Courtesy of GTAForums's The Nefarious Jester, we've got a lead on a few profitable random encounters. If you get lucky while free roaming through South Los Santos, you might find yourself encountering a man being robbed of his push-bike. It might seem hilarious to stand and watch. However, if you get the bike back, the man will purportedly inform you that he owns the ARK animal chain and provide you a substantial number of shares for free. Sweet! There's also a random ped mission to be found near the tunnel on the Interstate road heading north to the Bay. If you take a certain someone to the airport, he'll give you stock advice on what to purchase. So, do what the man says and buy now! That said, the best thing you can do for yourself right now is check out two GTA 5-related subreddits: r/GTAVstocks/ and r/GTAMarket . There's an absolute wealth of in-depth information to be found there, including a dizzying amount of theory crafting and mathematical reports. More interestingly, it looks like efforts have been made to artificially change the flow of BAWSAQ in order to benefit all parties involved. Think you can hang with the best? Go there. Free money and loads of codes! If you're stuck earning cash at the start of the game, you can give yourself a leg up with these GTA 5 cheats for free money and glitches. This article also contains a bunch of codes that will let you do all sorts of things, from spawning vehicles to changing the weather. Want to tackle GTA Online? This article will get you up to speed on the basics. Elsewhere on USG we've got all the info you need on GTA Online Gunrunning.